Leg Muscles: The lower leg muscles comprises the three compartment-Anterior Compartment, Lateral Compartment, and the Posterior Compartment. 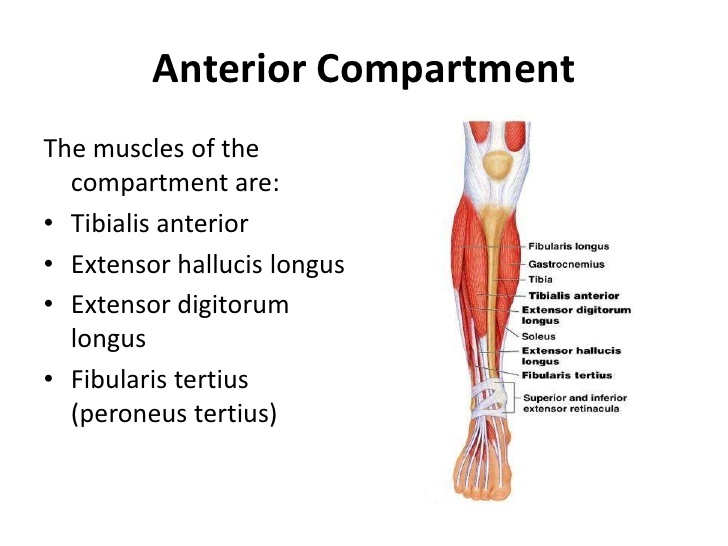 The anterior compartment of the leg comprises four muscles. The anterior compartment of the leg acts to dorsiflex and invert the foot through the ankle joint. The extensor hallucis longus and the extensor digitorum longus also extend the toes. The anterior compartment of the leg muscles is innervated by the deep fibular nerve (L4-L5) and supplied blood via the anterior tibial artery. Tibialis anterior: The tibialis anterior muscle is mostly located near the shin. Tibialis anterior originates in the upper two-thirds of the lateral surface of the tibia and inserts into the medial cuneiform and first metatarsal bones of the foot. The tibialis anterior works to dorsiflex and invert the foot. Extensor hallucis longus: The Extensor hallucis longus is a thin muscle, situated within the Tibialis anterior and the Extensor digitorum longus muscles. The Extensor hallucis longus is located on the lateral side of the leg. Extensor digitorum longus: The extensor digitorum longus muscle is situated at the lateral part of the front of the leg. The muscle performs several movements of the ankle and the toes. Peroneus Tertius: The peroneus tertius muscle is located in the lower limb. The Peroneus Tertius also was known as fibularis tertius. The lateral compartment of the leg muscles is; peroneal longus and brevis.The common function of the peroneal muscles is eversion. Both muscles are innervated by the superficial fibular nerve. Peroneus longus: The peroneus longus ( fibularis longus) is a superficial muscle in the lateral compartment of the leg and works to evert and plantarflex of the ankle joint. 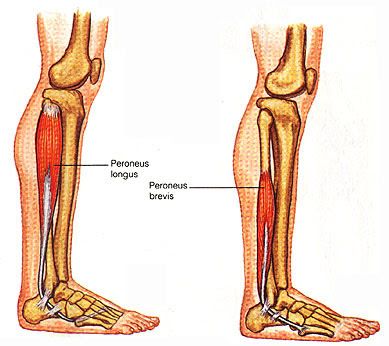 Peroneus brevis: The peroneus brevis lies below the cover of the peroneus longus, and is the shorter and smaller of the peroneus muscles. 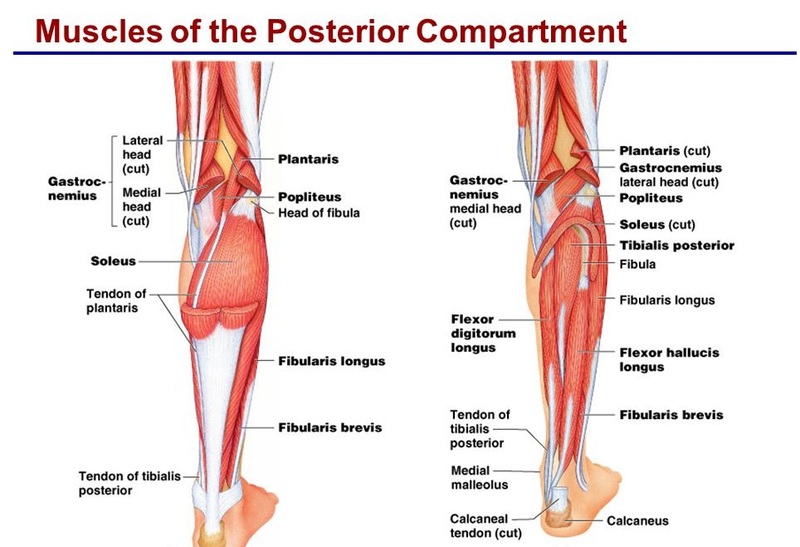 The posterior compartment of the leg comprises seven muscles, organized into two layers – superficial and the deep. The two layers are divided by a band of the fascia. Gastrocnemius: The gastrocnemius muscle is the two-headed that is in the back part of the lower leg. It goes from just above the knee to the heel, a two joint muscle. Gastrocnemius forms the major mass at the posterior of the lower leg and is an extremely powerful muscle. Soleus: The soleus Located in the superficial posterior compartment of the leg and it is a powerful muscle in the back part of the leg. It covers from just below the knee to the heel, and is committed to standing and walking. Plantaris: The plantaris is a superficial muscle of the posterior compartment of the leg. Plantaris is a rudimentary muscle. Functional importance is of transplantation. Popliteus: The Popliteus is a small muscle positioned at the back of the knee joint. The popliteus muscle in the leg is utilized for unlocking the knees during walking. It is too worked when sitting down and standing up. It is the unique muscle in the posterior compartment of the leg that works just on the knee and not on the ankle joint. Tibialis Posterior: The tibialis posterior muscle is placed in the deep posterior compartment of the lower leg. It is the chief stabilizing muscle of the leg. The tibialis posterior innervated by tibial nerve and blood is supplied to the muscle by the posterior tibial artery. Inverts foot at subtalar joint. Flexor Digitorum Longus: The flexor digitorum longus is located on the tibial side of the leg. Flexor Hallucis Longus: The flexor hallucis longus muscle is deep muscles of the posterior compartment of the leg that connects to the plantar surface of the distal phalanx of the great toe.